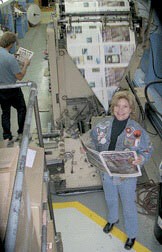 Mainstream Publications - San Juan Publishing Group, Inc.
Large press runs vary from “glossy” print publications of 32 -160 pages (or more) and typically 120,000 copies (or more) printed on heat-set web presses – to newsprint publications with one or multiple sections and anywhere from 8 pages (smallest on a newspaper press) to any number of pages (divisible by 8), to something called digital press, where any number of pages or copies can be printed, and yet each publication has a different content and/or appearance! Print is by no means dead, it’s just undergoing a period of change. Even though the web seems to be taking over how we present ourselves to our targeted audience, print is morphing nearly as fast as the web, growing new forms of print presentations even as you read this. We will help you devise a visual marketing plan that will work with all forms of communication, including print. We know print! 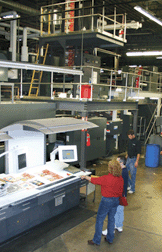 San Juan Publishing has been designing and publishing print publications for more than 20 years. Print comes in many flavors, all with different design and technical requirement and all of it very different from how a web publication is designed. You need a professional design expert, who can help you plan designs that will work with any and all presentation modes. with your printing needs, please contact us today.